The first automobile ro-ro terminal in Hunan province will become operational at Changsha New Port in October. It will allow cars to be transported on a roller ship, reducing transportation costs. As one of the 28 major inland ports in China, Changsha New Port, located in the core economic zone of Hunan province, has enjoyed rapid development in recent years. 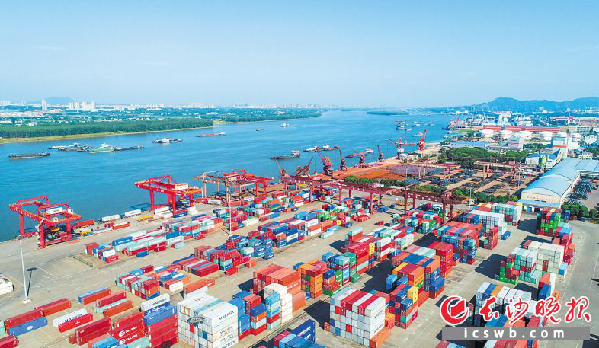 The port’s foreign trade export containers accounted for more than 60 percent of the province’s total, and it has undertaken more than 60 percent of internal feeder container transport in central Hunan. In the past eight months, Changsha New Port has achieved a container volume of 105,900 teus, with foreign trade accounting for over 90 percent. Hunan products, such as fireworks, agricultural products, automobiles, and construction machinery, have been shipped to countries all over the world. Tang Zhongliang, chairman of Hunan Changsha New Port Co, said that fireworks are one of Hunan’s main exports, and also his company's primary product. Thanks to the Belt and Road Initiative, Changsha Port has reached a record high throughput in the last three months. In August, the throughput of miscellaneous goods reached 580,000 tons, the highest since the port's inception. Tang also said that containers, the automobile ro-ro service, and steel will be the main focuses of the port in the future. After completion, Changsha New Port will become a public service platform for Changsha and Hunan province, and will have the most comprehensive functions and facilities. Roll-on/roll-off (ro-ro) ships are vessels designed to carry wheeled cargo, such as cars, trucks, semi-trucks, trailers, and railroad cars that are transported on and off the ship using either their own wheels or a platform vehicle, such as a self-propelled modular transporter. This is in contrast to lift-on/lift-off (LoLo) vessels, which use a crane to load and unload cargo. Ro-ro ships have either built-in or shore-based ramps that allow cargo to be efficiently rolled on and off the vessel when in port. The ramps and doors may be located in the stern, bow, or sides, or any combination thereof.